12 Apr 2018 / 19:21 H.
GAZA CITY: Egypt on Thursday opened its largely sealed border with the Israeli-blockaded Gaza Strip for three days, on the eve of more planned protests against Israel, Palestinian authorities said. 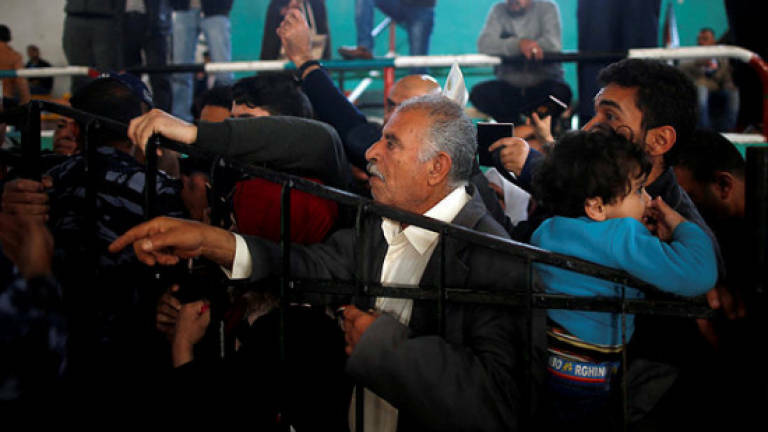 In just the fourth such opening this year, the Rafah crossing to Egypt's Sinai region will be open until Saturday for humanitarian cases, the interior ministry in Gaza said. An AFP photographer saw a first busload of 70 people, including women and children, crossing on Thursday morning. The opening comes ahead of a third consecutive Friday of planned mass protests along the Gaza-Israel border. Israeli media reports have said Egypt, one of only two Arab countries to have signed a peace treaty with the Jewish state, had been negotiating with Gaza's Islamist rulers Hamas to seek to calm the crisis. Thirty-two Palestinians have been killed and hundreds wounded by Israeli forces since March 30 as thousands have approached the border fence and clashes have erupted. Israel says its forces have opened fire to stop attempts to damage the fence, infiltrations, bids to carry out attacks and at those seeking to harm soldiers. The Rafah crossing is the only exit for Gaza residents except into Israel, but Egypt has largely sealed it in recent years, citing security threats. Egyptian authorities have had a strained relationship with Hamas, which began as an offshoot of Egypt's banned Muslim Brotherhood. For more than a decade, Israel has imposed a crippling blockade on Gaza that critics say amounts to collective punishment of the coastal territory's two million Palestinians. Israel says the blockade is necessary to isolate Hamas, with which it has fought three wars since 2008. In October, Egypt brokered a reconciliation agreement between Hamas and Fatah, the party of Palestinian president Mahmud Abbas, that was supposed to see the Islamists give up power in Gaza.